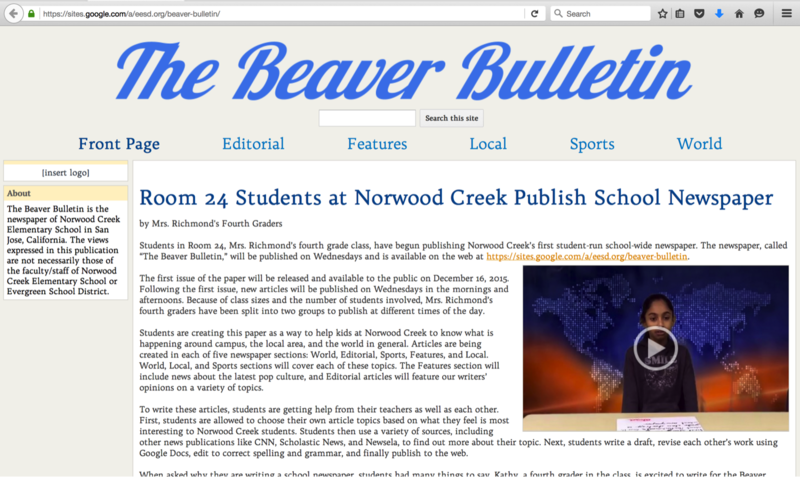 Students in a variety of classrooms at Norwood Creek produce Norwood Creek’s first student-run, school-wide newspaper. The newspaper, called “The Beaver Bulletin,” is published on Wednesdays and Fridays and is available online. The first issue of the paper was released and made available to the public on December 16, 2015. Following the first issue, new articles are published on Wednesday and Friday afternoons. Classrooms share the responsibility of writing for the newspaper. Students in each classroom each write one article of their choice for their assigned section. They then collaborate to edit and revise their work prior to publishing the article for all to see. Once one class completes an issue, the next class begins planning for the next issue. Students are creating this paper as a way to help kids at Norwood Creek know what is happening around campus, the local area, and the world in general. Articles are being created in each of five newspaper sections: World, Editorial, Sports, Features, and Local. Students are responsible for choosing an article topic, researching and gathering information, conducting interviews, drafting, self-editing, and revising their writing. Check back often to see the latest articles from The Beaver Bulletin! To view the current edition, click on The Beaver Bulletin or click the image above.